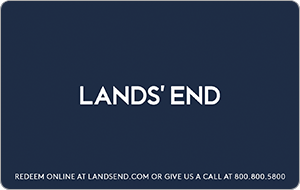 Since Lands’ End® began doing business in 1963, they’ve created clothing that sets the highest standards for enduring quality, style and value. You can order men’s, women’s and kids’ clothing (along with a line of luxurious home fashions) with confidence, because your satisfaction is Guaranteed. Period.® Use their gift card to shop via phone or online at landsend.com. To request a catalog, call 1-800-800-5800 or visit their website at landsend.com.